On July 22 Chris Swannell was ordained into the priesthood after a 13 year wait since he was ordained deacon. Arch Bishop John Paterson presided with Bishop Jim White ordaining Chris. It was a long awaited joyful occasion held at Christ Church Whangarei because of the anticipated large number of friends, well wishers, clergy and family who attended. 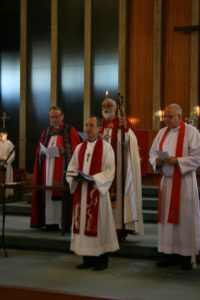 The Reverend Chris Swannell presided at his first service on August 5. This entry was posted on Monday, August 13th, 2018 at 1:33 pm	and is filed under Special services, Uncategorized. You can follow any responses to this entry through the RSS 2.0 feed. You can leave a response, or trackback from your own site.